This post explains what the White House Easter Egg Roll is and how to get tickets (lottery). Spring in Washington DC is one of the best times of the year to visit the nations capital. With the cherry blossoms in bloom, warm weather finally here, it is the a great time of year to get out and enjoy some of the many activities Washington, DC has to offer. If you are planning a visit or live in the area, the White House Easter Egg Roll will be on April 22, 2019 and it is is the hottest ticket in town. If you have children age 12 and under, get your tickets and join the first family on the South Lawn of the White House grounds from 8 am to 5 pm for a day full of activities; visit with the Easter Bunny, enjoy storytelling, sports, live musical performances, cooking classes, and the traditional White House Easter Egg Roll. White House Easter Egg Roll tickets are given out as a lottery. The date that the lottery is usually about six weeks before the event. The lottery will be open at 10am on February 28, 2019! Entering the lottery is free of charge, and winners will be notified via email in March 2019. To enter the lottery, you will be prompted to create an account on the Recreation.gov website. You will presented with a list of available times and should rank them in order of preference. Each household is limited to one lottery application. You will need to list how many adults and how many children with a maximum of six tickets. 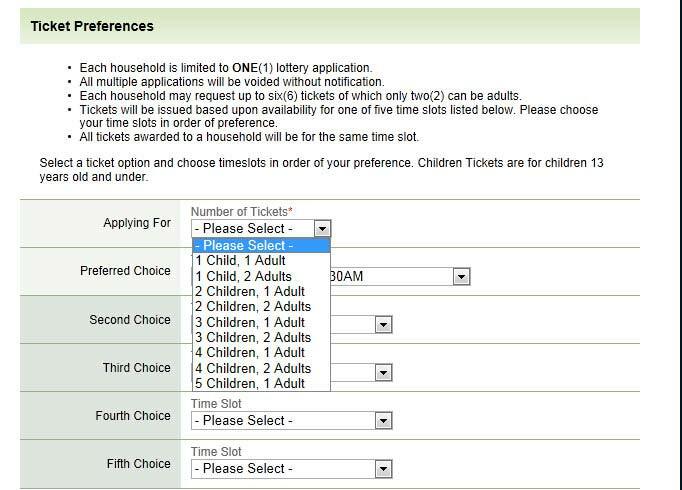 Here is an example lottery screen from 2013 (subject to change for 2019). Alternatives to Easter Egg Roll: If you can’t get tickets to this event, you can apply for a separate tour of the White House. Learn how to tour the White House here. Or plan on going on one of our National Mall tours we offer that day. Location: White House, 1600 Pennsylvania Ave., NW, Washington DC; Phone (202) 456-7041. There is no White House Metro Station. The closest metro stop to the tour entrance is Metro Center (red, orange, blue and silver lines) (take the 13th Street exit), which is just a 7-minute walk. When you come up the escalators, you will be facing 13th Street. Take 13th Street south (downhill) and make a right turn on E Street and proceed straight until you reach 15th Street. McPherson Square Metro station (orange, blue and silver lines) is also close to the White House. We strongly recommend using our Google Map for directions to the entry point. Mass transit is recommended for reaching the White House. If you must drive, you can find a parking spot at a nearby garage through a service called Parking Panda. This website allows you to reserve guaranteed parking spots ahead of time, often for a cheaper price than the garage itself would charge. All guests will enter the event from the Ellipse and will have to go through a security screening process. No food or beverages are allowed on the grounds. Parents CAN bring baby strollers, diaper bags, baby formula, and baby bottles. Cost: Just like our tours, FREE! Since 1878, Presidents and their families have celebrated Easter Monday by hosting and “egg roll” party, which is held on the South Lawn of the white house. This is one of the oldest annual events in the White house history. Although the Easter Egg roll was previously held on the grounds of the U.S. Capitol building, in 1878 celebrants were not allowed to roll eggs on the grounds of the Capitol over concerns and eventual bill that banned the rolling of eggs on the grounds. In 1876, President Ulysses S. Grant signed that bill into law and the following year heavy rain cancelled the day’s activities. The following year, 1878, egg rollers came to the Capitol grounds but were ejected by Capitol Hill police. President Rutherford B. Hayes gets word of the disappointed children just down Pennsylvania Avenue at the Capitol and invited them to come to the White House South Lawn. Since then, young children and their families have come to the White House on Easter Monday to enjoy the annual festivities. Be sure to take home or order an official 2014 White House Easter Egg, which is made of hardwood and comes in four custom colors, which includes the stamped signatures of the President and First Lady.